Nokia wants to help carriers upgrade their mobile networks to 5G -- but it also wants to give home Wi-Fi a boost, President and CEO Rajeev Suri revealed Sunday. The networking equipment vendor will soon release a range of mesh Wi-Fi products, including gateways and associated "beacons" intended to improve in-home connectivity. Suri showed off one of the beacons at a news conference in Barcelona on the eve of Mobile World Congress. Housed in a sleek white case, it is intended to support high-bandwidth applications such as streaming VR (virtual reality) or remote video monitoring of the elderly. "It's far better than those nasty black boxes that typically get hidden in a closet," he said. The beacons use machine learning to optimize connections for different devices. Nokia says they can detect 17 different sources of interference, including Bluetooth speakers, cordless phones and microwave ovens, and route around them using dynamic path selection. Nokia has been dipping in and out of the consumer market for years, first selling its smartphone business to Microsoft, then buying Withings, a French maker of connected health devices, before selling the remains of its smartphone business to HMD, which still operates under the Nokia brand. But Nokia's home Wi-Fi devices won't be offered directly to consumers when they go on sale in June: They'll be sold via service providers as part of Nokia's end-to-end networking portfolio, and will integrate with its smart home gateways. Nokia already has 47 million home gateways installed worldwide. Nokia's mesh networking devices are self-organizing and self-healing, and are able to re-route in under half a second if a network node fails or is disconnected, the company says. That ability to spot problems and resolve them before the customer has time to complain is important for service providers: 30 percent of support calls from their customers are related to poorly performing Wi-Fi, Suri said. 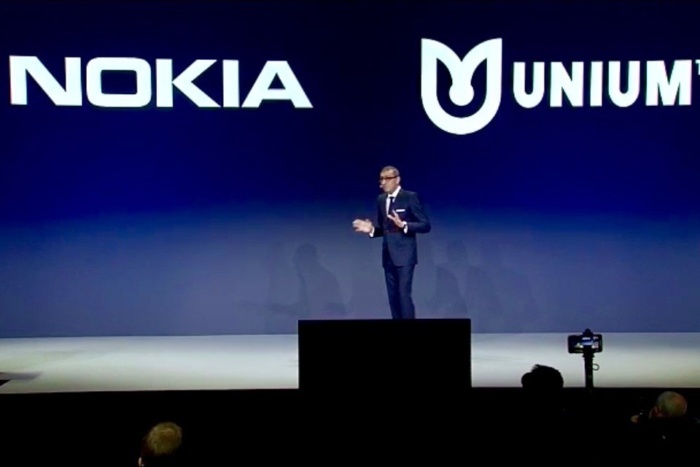 Nokia President and CEO Rajeev Suri announced the company's plan to acquire mesh networking specialist Unium at a news conference in Barcelona on Feb. 25, 2018. Suri also announced that Nokia is buying U.S. mesh networking specialist Unium, the company behind some of the software smarts in Nokia's new products. When technology companies make acquisitions like this, they often struggle to integrate the expertise they have bought into their ongoing product range. Not so Nokia, which has been working with Unium for some time. It will demonstrate its integration of Unium's software on its stand at Mobile World Congress in Barcelona this week, and expects to close the acquisition by the end of March.